Kajiwara Sora and her friends in the art club sketch what they see and make observations on life. That's really all there is to it. Sketchbook features beautiful scenery, plenty of feel-good moments, and cats. Can't forget the cats. It's just the kind of show that puts a smile on your face. A fine example of a Slice of Life series. An anime, titled Sketchbook full color's, aired in 2007. Adaptation Distillation: The manga consists largely of Japanese word jokes, but only some surrounding Kate found their way into the anime. Anime Accent Absence: Averted with Kate, also combined with Surprisingly Good English. Author Appeal: The mangaka seems to be quite fond of cats and apparently knows quite a bit about animals in general -- especially bugs and fish. Balloon Belly: Natsumi in episode 12. Beautiful All Along: When Tsukiyo puts up her hair in the manga, nobody recognizes the girl with the pretty face. Add Asaka to the list as well when she untied her hair. Breaking the Fourth Wall: Ryou and Fuu, they are talking to the audience, which only confuses the other characters a little, as they are known as "eccentric". 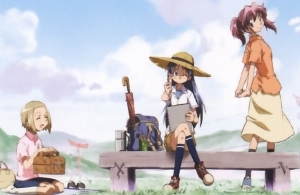 Canon Immigrant: Minamo, Daichi's little sister, first appeared in the anime adaptation, but was re-introduced into the manga about two years later, in chapter 97. Catch Phrase: Sora's "uh huh". Character Development: EVERY single character goes through this, but it applies most to Sora. Compare to how she introduces herself to Natsumi, Hazuki, and Kate to how she introduces herself to the waitress at the diner in the last episode. Cherry Blossoms: One of the funniest scenes involves a cherry blossom viewing party. Cloudcuckoolander: Ryou and Fuu, although most of the cast is a bit wacky. Arguably Sora fits just as well. The big difference is that Ryou and Fuu seem to do it on purpose, for fun. Sora doesn't notice there's something off with herself. Kokage has her moments as well. In fact, it'd probably be faster to list the characters who aren't Cloudcuckoolanders. Cute and Psycho: Played for laughs when Kurihara introduces a kind of planarian and mentions that it can regenerate parts of it that get cut off. Kate promptly pulls out a box cutter knife while smiling happily. Narration box: Kate had a very angelic smile. Demoted to Extra: Tsukiyo Ooba's role, already not that big in the manga, has been assigned only a few seconds of spoken dialogue in the anime--which is a shame, since she is a genuinely funny character. Cute Kitten: A Five Cat Cast by episode 11 -- Mike, Haa, Grey, Kuma, and Buchi. There's a few other cats in the manga too. Evolving Credits: Changes slightly depending on the cast. Eyes Always Shut: The club president and Juju. Also Asakura-sensei, who appears in the manga from time to time and does magic tricks. Lampshaded - when the art club goes to see fireworks, they all decide to squint at the fireworks and see what that looks like. No one can tell if these two are squinting or not. Friend to All Living Things: Subverted in that the cats don't view Sora as such. Double subverted at the end of episode 11. Played straight with Kurihara's love for all things living. Fukuoka Regional Accent: Natsumi. Strange enough, nobody else talks this way, even though the series takes place in Fukuoka. First Name Surname First Name: In the final episode, this is how Sora introduces herself to the waitress. Well, Asou was gonna introduce her to the waiter before she interrupts and says this trope because of it. Gratuitous... Japanese? : It's hard to tell, because Kate speaks accented Japanese even though her seiyuu is Japanese. Goldfish Scooping Game: Sora decides to think of it as "goldfish saving" (the same in Japanese). She then decides it sounds better without the "goldfish" part. High School Rocks: Sora's fellow students may be eccentric, but they're also absolute sweethearts. Hive Mind: Ryou and Fuu, elevated to sometimes creepy levels in the anime. Huge Schoolgirl: Juju, although it doesn't particularly bother her or the others. Inner Monologue: The main reason Sora even needs a voice actor. Kindhearted Cat Lover: Sora doesn't have a cat, though a few of her friends do, but is your typical Friend to All Living Things...but the kid keeps giving them expired food, which her brother calls her out on. so this might be subverted in the cats' eyes until she realizes her error. Last-Episode New Character: Tsukiyo and Soyogi-sensei. No Communities Were Harmed: Although never mentioned explicitly, the series appears to take place in Shime, Fukuoka. Otaku: Kurihara Nagisa, one of the rare examples of an otaku about something other than anime. She likes nature, especially insects. Schoolgirl Series: There are a few male characters, but both adaptions, especially the TV one, focus on Sora, Hazuki, and Natsumi. Kasugano's Adult Child personality and the focus on the wackiness of the art room cement this series as a Schoolgirl one. Shout-Out: To Aria, with the "president" of the Aria Company as the mascot of a bowling center. Also, at the very end of the last episode, there's a picture [dead link] of President Aria and Akari meeting Mike and Sora. A discussion about Paracerura tattaka turns into a shoutout to Hamtaro in the manga. Shown Their Work: Some of the insects seen later are discussed in the notes. Something Completely Different: episode 5, done from the cats' point of view. Surprisingly Good English: Kate: and her cat Buchi. Good job for the creators for picking someone who can speak very good English to voice her, unlike Ai Yori Aoshi. Since when Americans speak bad English? Strong Family Resemblance: Played with. Sora's classmates were surprised that her brother Ao does speak. The Quiet One: Sora, who's actually the protagonist. Though she does Inner Monologue to the audience quite often. In the manga, there's no confirmation as to whether or not she ever speaks at all. None of her dialogue (if it is that) is conveyed with speech bubbles. The Unintelligible: Grey, who can only meow (probably because he's the youngest). Wacky Homeroom: Wacky Art Club, same thing. This page was last edited on 20 September 2018, at 11:31.